SASWCD’s upcoming “Plants Grow Soil” workshop to be held Thursday, November 2, 2017 at the Southern Aroostook Ag Museum in Littleton. We have a great line-up of speakers with credits being offered. For more information contact: Angie Wotton, SASWCD Executive Director, at (207) 254-4126. Maine Soil & Water Conservation Districts (SWCDs), in cooperation with USDA-Natural Resources Conservation Service (NRCS), are conducting a Natural Resources Assessment (NRA) across the state and need the help of Maine’s citizens! The goal is to determine natural resource priorities so that Districts and NRCS can assist landowners, professionals, and municipalities with best management practices that protect and improve land and water resources. To gather this information, Districts are distributing a statewide survey (available at http://www.surveymonkey.com/r/JQ5GPL5) and holding local meetings to document natural resource conservation concerns and to build on the data collected in the first assessment, completed in 2011. The priorities articulated in the survey and meetings will inform state and local natural resource programs and funding opportunities in the coming five year cycle. To encourage participation, some conservation districts will enter everyone who completes a survey – or attends a meeting – into a drawing for an exciting prize. Districts encourage farmers, woodland owners, resource professionals, and members of the general public to take advantage of this opportunity to make your voice heard. The survey may be accessed online at http://www.surveymonkey.com/r/JQ5GPL5, or you may contact your local conservation district for a paper copy at maineconservationdistricts.com/district-locations. Preliminary survey results will be available at local, county level meetings that will be scheduled throughout the month of March. Join friends and neighbors at a local meeting for a lively discussion about protecting Maine’s natural resources and complete a survey to be eligible for a prize. For more information about the Natural Resources Assessment, to access the online survey, to contact your local conservation district, or to find out when your county meeting will be held, please visit the Maine Association of Conservation Districts website at maineconservationdistricts.com. USDA-NRCS and Maine Association of Conservation Districts are equal opportunity providers and employers. 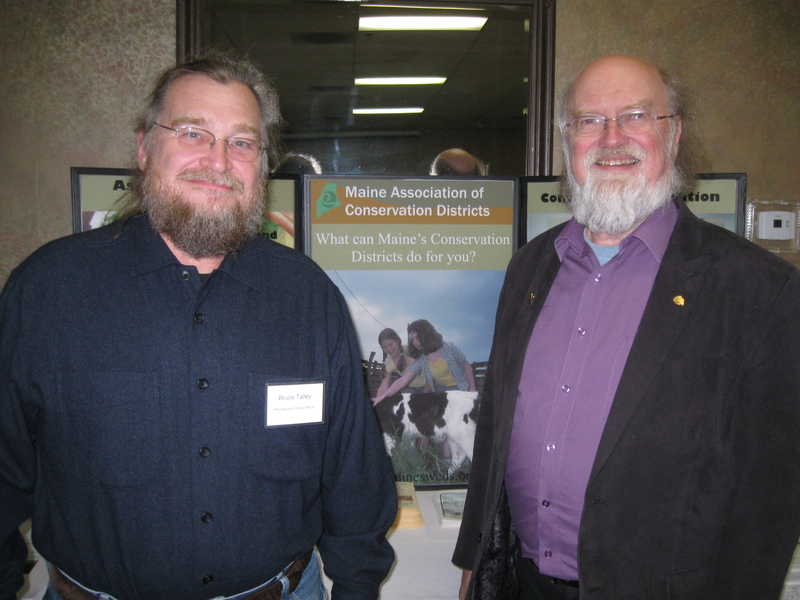 The Maine Association of Conservation Districts (MACD) recently convened at the Spectacular Events Center in Bangor for its Annual Winter Meetings. The 16 conservation districts in Maine that were represented at the meeting serve as the bridge between citizens and local, state and federal agencies. They provide conservation leadership, teach the value of natural resources, and help plan and implement voluntary programs to both prevent and solve local environmental problems. They work with many partners to provide assistance to the public for their use of land, soil, water, wildlife, forest, plants and other natural resources. At this meeting preparations were made for several statewide conservation initiatives, including natural resource assessments to be conducted in Spring, 2016, throughout all counties in Maine. These assessments, to be conducted in partnership with the USDA’s Natural Resources Conservation Service (NRCS), will help determine local conservation priorities and also provide a comprehensive framework for evaluating NRCS technical and financial conservation assistance in Maine. Presentations were also made on the numerous soil health initiatives underway in Maine. Dr. Brandon Smith, the Northeast Team Leader for new NRCS Soil Health Division, and Tony Jenkins, NRCS State Resource Conservationist, spoke about the soil health challenges facing farmers. They also discussed NRCS plans for a broader adoption of agriculture management practices that will maintain or enhance soil functions. “Healthy, and sustainable agricultural soils are measured by ecological factors such as organic matter and biology, as well as by economic values, such as agricultural productivity and crop yields,” Jenkins explained. The meeting also addressed a number of soil health initiatives to assist potato farmers in Aroostook County. Angie Wotton, Southern Aroostook Soil and Water Conservation District (SWCD) Director and Kassy Michaud, Central Aroostook SWCD Executive Director, gave presentations on their work with multiple public and private partners, including the Maine Department of Agriculture, Conservation and Forestry (DACF) and the Maine Potato Board, to help potato farmers improve soil health. These initiatives will also help farmers prevent soil erosion and improve water quality using innovative cover cropping, green manures and other technical assistance provided through the Regional Conservation Partnership Program (RCPP). The RCPP promotes coordination between NRCS and its partners to deliver conservation assistance to producers and landowners. A MACD Advisory Council Meeting with DACF’s Commissioner Walt Whitcomb focused on the gains being made in local, sustainable agriculture in Maine. Whitcomb noted that “Maine is the largest agricultural producing state in New England, and the state has prime farming soils and a lot of untapped potential,” with Maine’s primary agricultural products being potatoes, blueberries, apples, eggs, dairy and maple syrup. Whitcomb also noted that the DACF is going to continue to make the partnership with conservation districts a cost-efficient and effective local delivery system. During the MACD Board of Director’s Meeting, the torch was passed to Bruce Talley of Medford, Maine, to begin his three-year tenure as the newly elected MACD President. Talley, who also serves as a Supervisor of the Piscataquis County SWCD, notes that “healthy soil and water are as essential as the air that we breathe.” He is excited to work with conservation districts throughout Maine, and their conservation partners, to plan, implement and manage the state’s natural resources for future generations. Unseasonable weather is giving the nonnative insect plenty of time to reproduce before its caterpillars wreak havoc next spring. In the Maine Potato Board’s annual tradition touting the next generation, Ryan Crane from Exeter is the young farmer being held up as a model for managing a large, rotating potato operation.